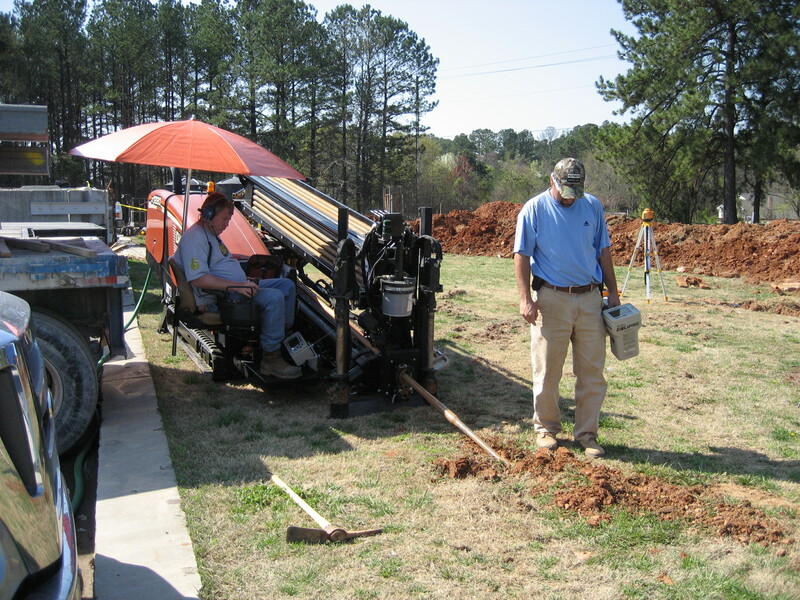 The Septic Tank Effluent Line which connects the main office building's previously existing septic tank to the new engineered system was put in place by the boring crew in the photo (Above). They successfully bored from the Starting Point seen here, under the parking-lot, and did so without damaging or disturbing the surface. The photo (Above) shows the entry or start point for the boring as indicated by the umbrella on the boring equipment seen in the back ground. 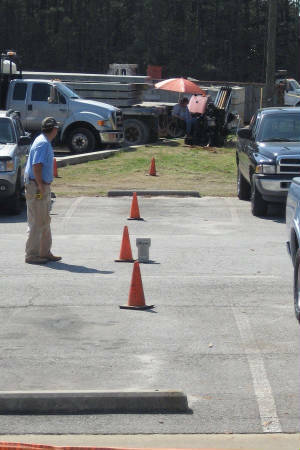 The cones on the parking-lot indicate where the boring occurred under the parking-lot. 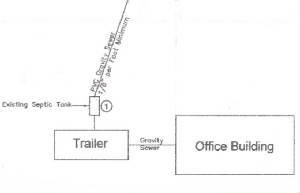 The Diagram (Above) shows the existing septic tank at this location. This image is a cropped section of the Blue Prints. The photo (Above) is of the ending point where the boring bit surfaced after boring under the parking-lot. The boring bit was then fitted with a bolt and attached to the new Septic Tank Effluent Line. 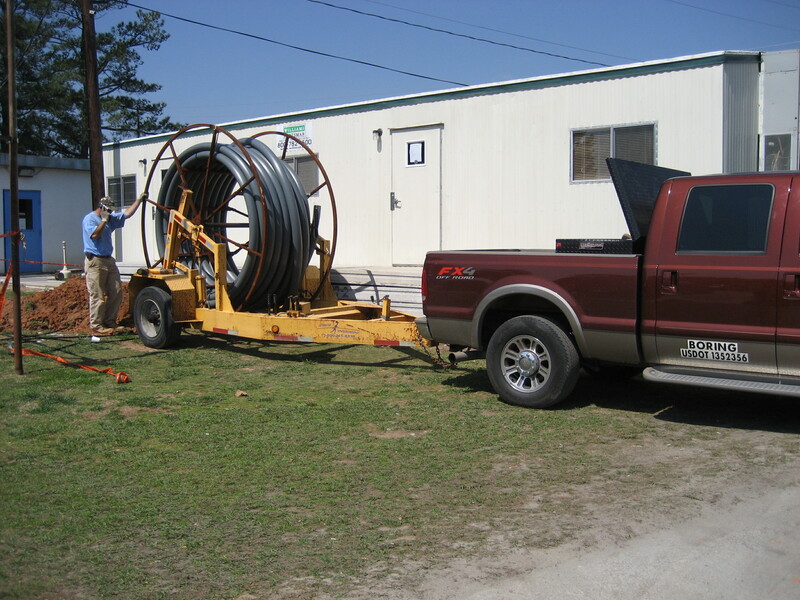 The Septic Tank Effluent Line (the pipe on a reel seen in photo above) was then pulled by the boring equipment back to the starting point. This process placed the new Effluent Line under the parking-lot. 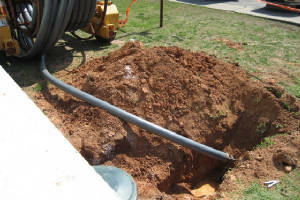 The photo (Above) is of the newly laid Septic Tank Effluent Line after it exited the ground at the Starting Point. 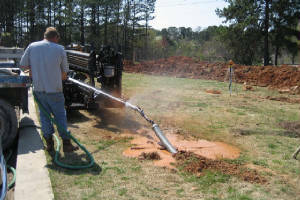 In this photo, the new Septic Tank Effluent Line is being washed off after being pulled under the parking-lot from the ending point at the Main Building to the starting point in this and the first photo.